2.Date and Timings of DEECET: DEECET will be conducted on 04-05-2017 to 07.05.2017 in all 13 Districts of the state of A.P. The test will be conducted through online in 3 spells. 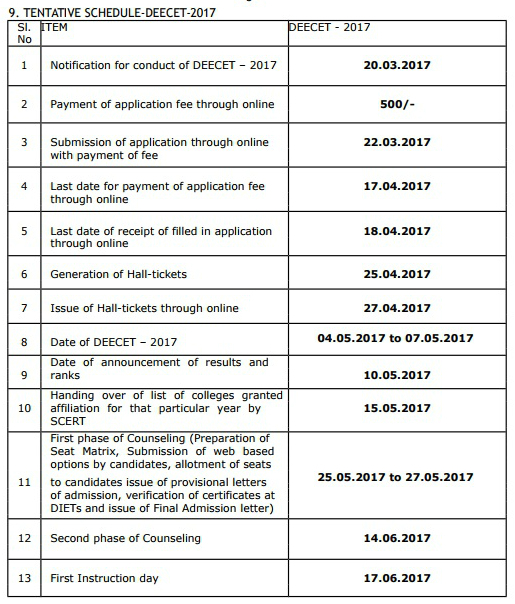 3.Fee and submission of Application Online : The fee prescribed for appearing for DEECET (including examination fee) is Rs500/- (Rupees Five Hundred Only).Candidates can pay the fee through payment Gateway between 22.03.2017 to 17-04-2017 and submit online application at the DEECET website http://cse.ap.gov.in between 22.03.2017 to 17-04-2017. 4. Procedure for submission of application online: Detailed procedure for applying ONLINE is given in the Information Bulletin. Candidates can download the “Information Bulletin” free of cost from the DEECET website http://cse.ap.gov.in from 20.03.2017 onwards. Candidates can submit their applications through online from 22.03.2017 to 17-04-2017. 5. Examination centers for DEECET: DEECET shall be conducted in all the 13 Districts of the A.P state. Candidate can choose any District of his/her choice for online examination center. 8. Storage of Examination material: The Examination related material will be preserved for six months in online from the date of Examination and no application in this regard will be entertained beyond this period.